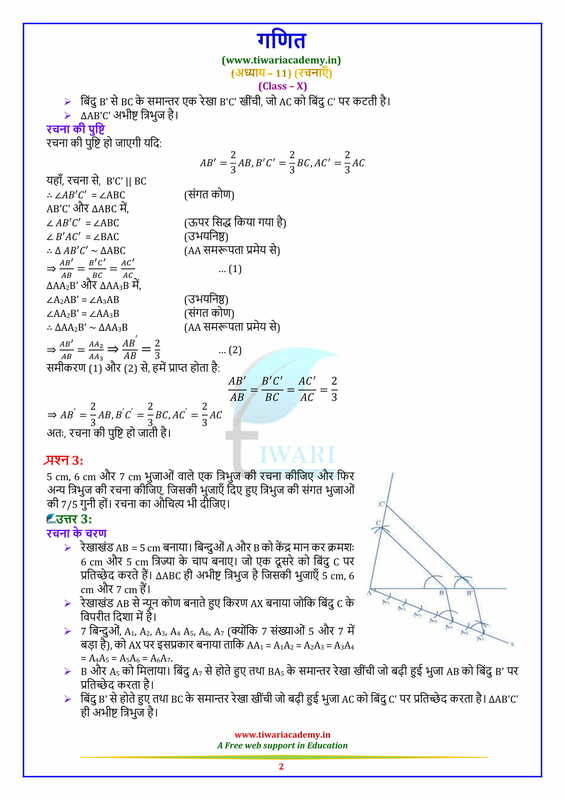 NCERT Solutions for Class 10 Maths Chapter 11 Exercise 11.1 Constructions in English Medium and Hindi Medium PDF form to free download or view online. 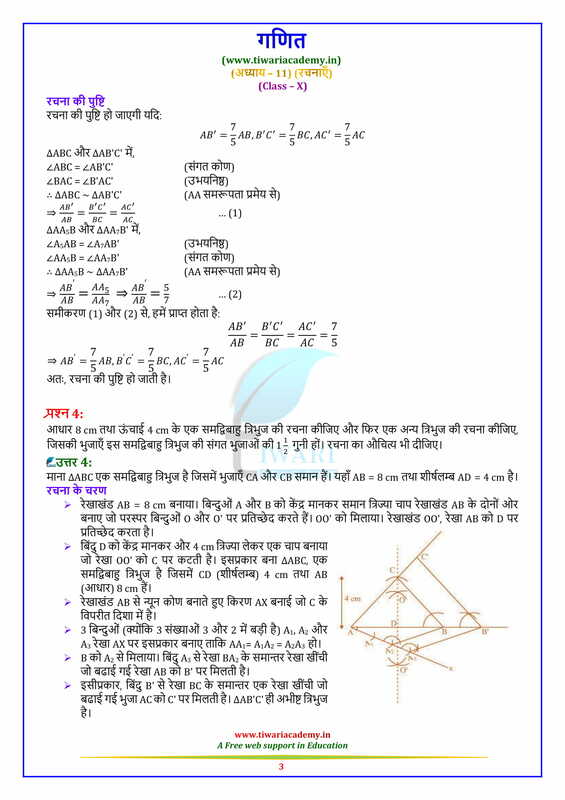 Class 10 Maths Solutions in PDF for all chapters are being provided to use online. 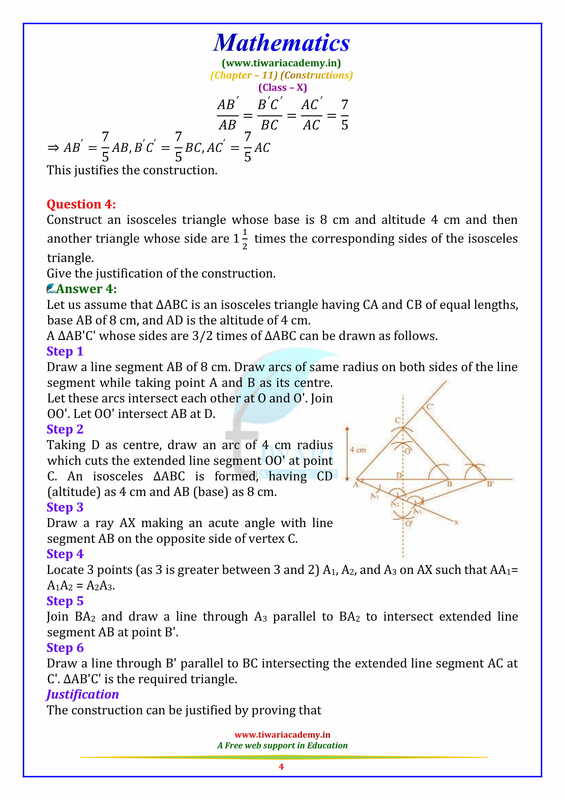 Click here to use Exercise 11.2 in PDF form or view online. Draw a line segment AB = 7 cm. 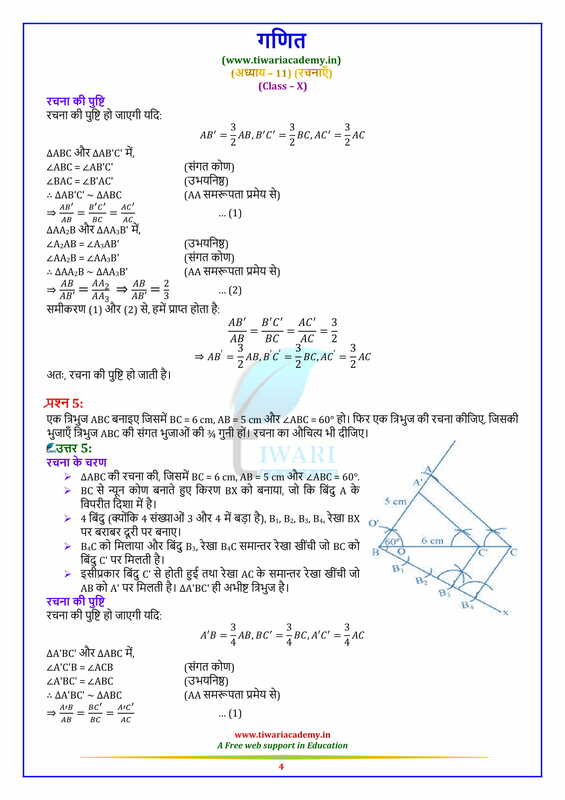 Take a point P on AB such that AP: PB = 3:4. 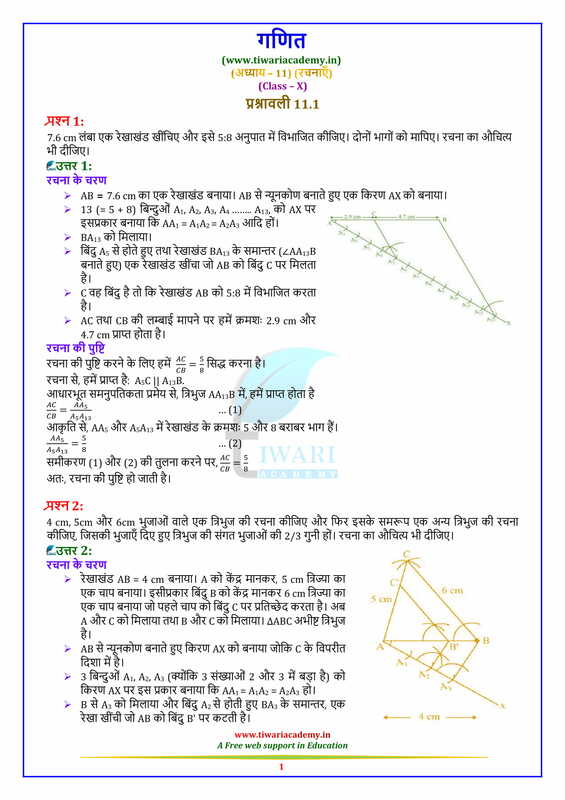 Draw a line segment PQ = 10 cm. 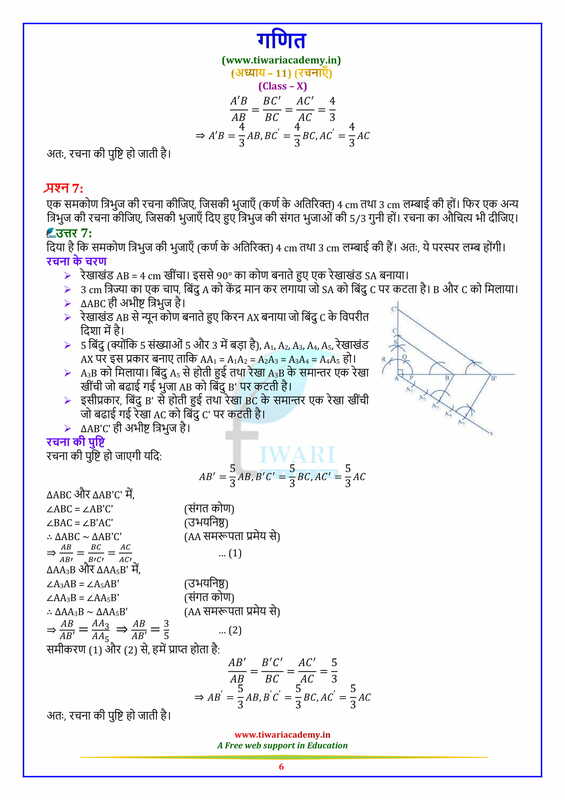 Take a point A on PQ such that PA/PQ = 2/5. Measure the length of PA and AQ. 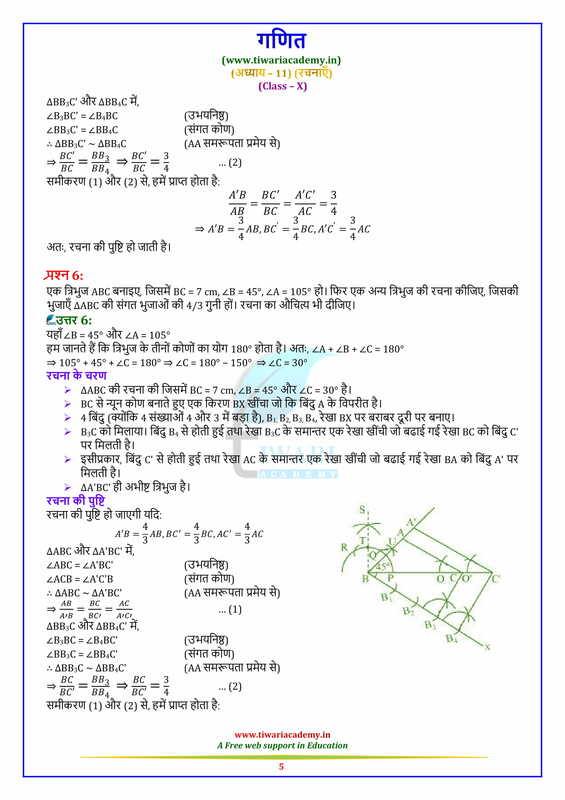 Construct a ∆ABC in which BC = 6.5 cm, AB = 4.5 cm and ∆ACB = 60°. 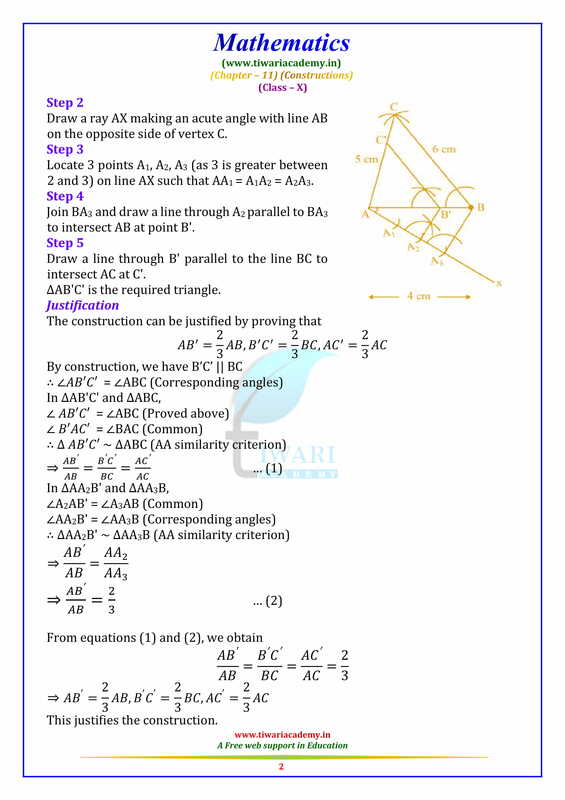 Construct another triangle similar to ∆ABC such that each side of new triangle is 4/5 of the corresponding sides of ∆ABC. 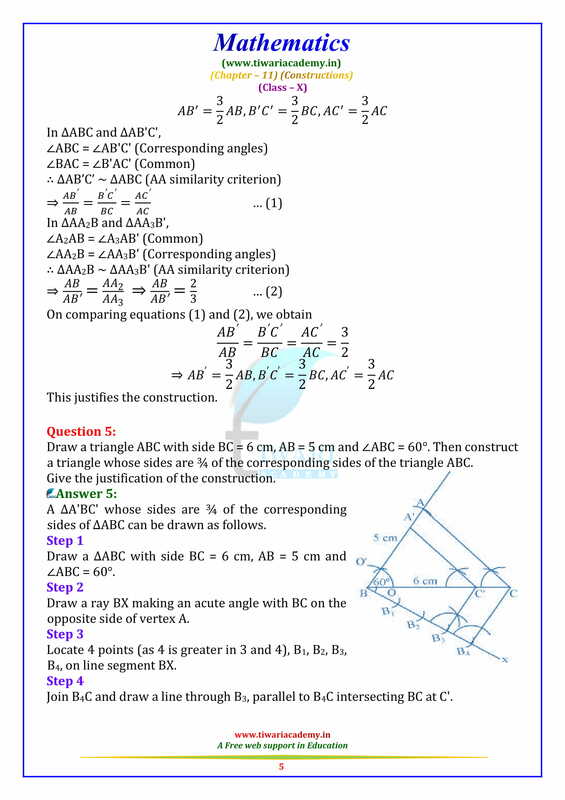 Draw a triangle XYZ such that XY = 5 cm, YZ = 7 cm and ∆XYZ = 75°. Now construct a ∆X’YZ’ ~ ∆XYZ with its sides 3/2 times of the corresponding sides of ∆XYZ. 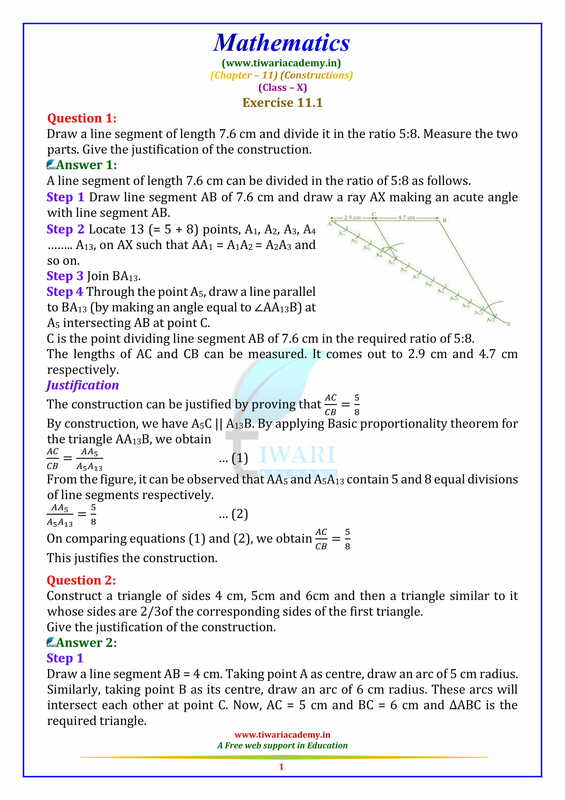 Construct an isosceles triangle whose base is 8 cm and altitude 5 cm and then construct another triangle whose sides are 3/4 times the corresponding sides of the given triangle. 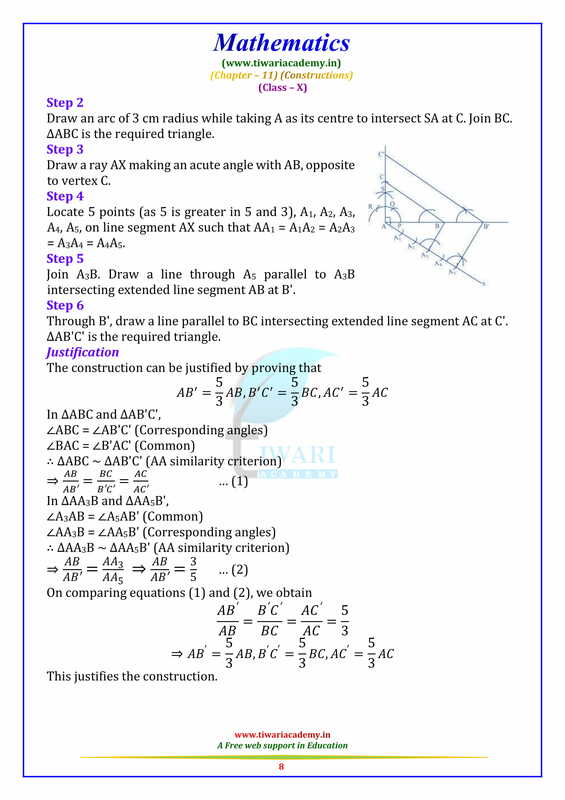 Draw an isosceles ∆ABC with AB = AC and base BC = 7 cm and vertical angle is 120°. Construct ∆AB´C´ ~ ∆ABC with its sides 4/3 times of the corresponding sides of ∆ABC. Draw ∆PQR in which angle Q = 90°, PQ = 6 cm, QR = 8 cm. Construct ∆P‘QR´ ~ ∆PQR with its sides equal to 2/3rd of corresponding sides of ∆PQR. 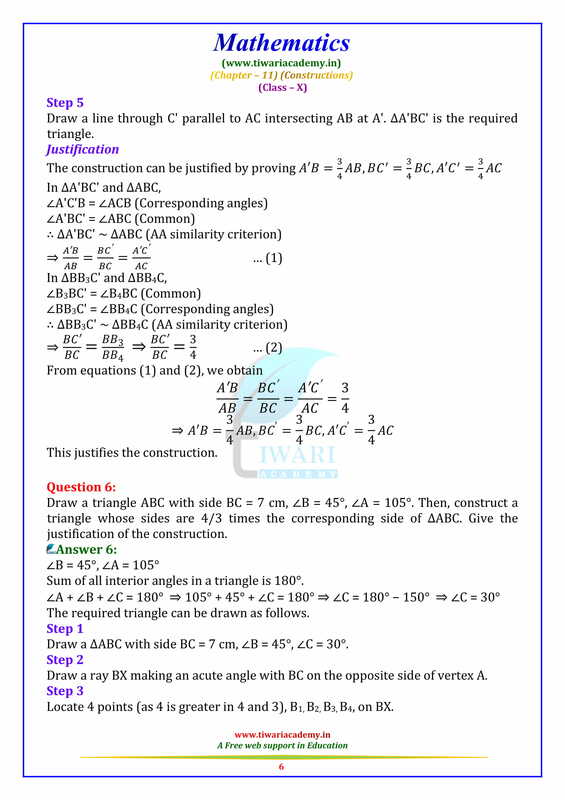 Construct a right angled triangle in which base is 2 times of the perpendicular. 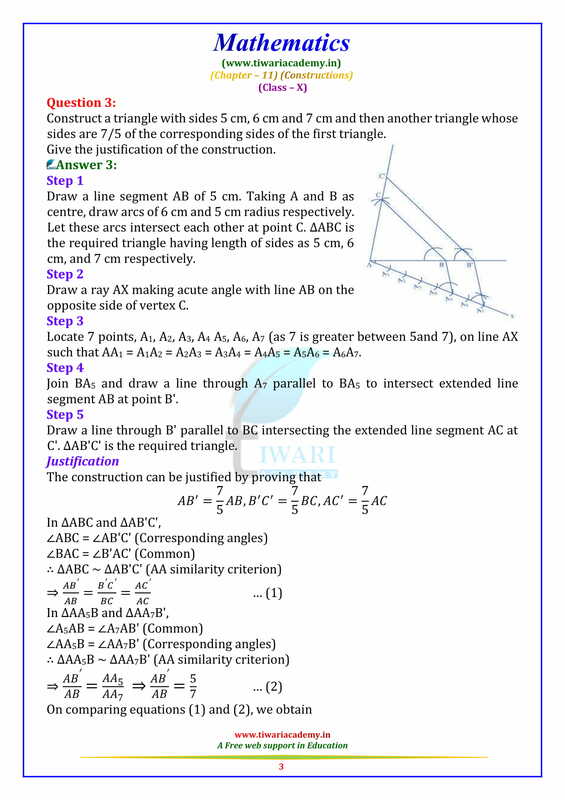 Now construct a triangle similar to it with base 1.5 times of the original triangle. 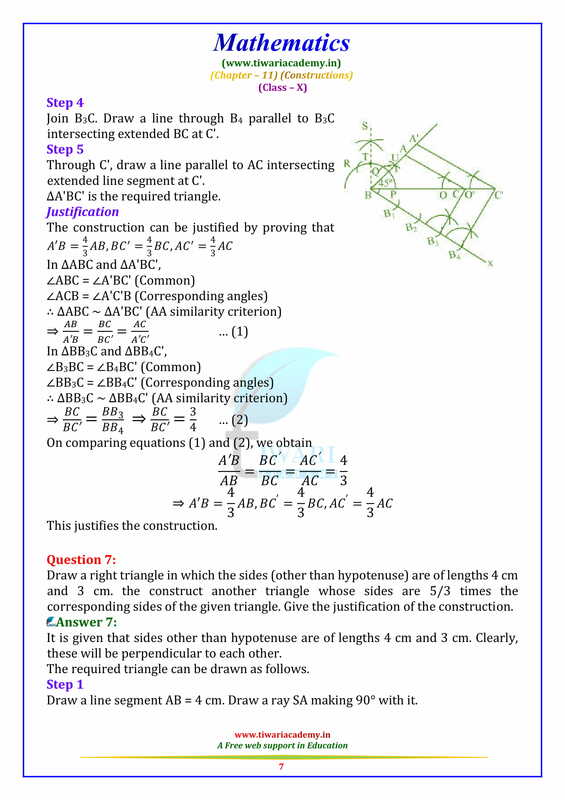 Draw an equilateral triangle PQR with side 5 cm. Now construct ∆PQ´R´ such that PQ/PQ´ =1/2 Measure PQ´. Draw a circle of radius 4 cm with centre O. Take a point P outside the circle such that OP = 6 cm. Draw tangents PA and PB to the circle. Measure the lengths of PA and PB.